2009, Wolfsburg: The German car manufacturer Audi – famous for its elegantly slick and sporty design – is celebrating its 100th anniversary. For this special occasion Audi decided to design a unique instrument, representing the company’s dedication to stunning design. Despite the futuristic aesthetics of this piano it obviously meets the ultimate sound requirements imperative to all Bösendorfer Grands. A stunning interplay of form and sporty elegance. The perfect sports car, the perfect grand piano. The shape of the Bösendorfer Grand designed by F.A. Porsche honours both companies obsessed with the ultimate design. The high-tech material of the piano’s lid is lightweight honeycomb allowing it to be neatly integrated in the outer silhouette of the piano. 2006, Vienna: Reduced, contemporary. The industrial design of the Bösendorfer Edge is proclaimed winner of the international Bösendorfer Piano Design Award. Following clear lines and shapes, the design elaborates on a concise, formal appearance unfolding a smooth presence. The Bösendorfer Grand Artisan is a stunning piece of art even before one single tone is played. Past our times in the second millennium BC in the Orient, marquetry depicting delicately slender designs have been a decoration of special objects dear to the spectator and the artist. Extravagance. At the end of the 16 century, a new movement in art was spreading quickly all over Europe and eventually Austria. It is the dawn of the Baroque. In music, the virtuous compositions of Johann Sebastian Bach are about to create controversy, in fine arts spectators are about to gaze in astonishment at sumptuous splendour in visual expressions and architecture. Bright colours fancy playfully carved lines, gilded frames and sculptural figures. Louis Seize, an artistic style named after the French King Louis XVI, is illustrated by natural forms and shapes. Facing the end of the Baroque era Classicism celebrates the world of antiquity and Greek ideals. Naturalistic forms such as baskets of flowers, willow boughs, garlands of fruit, ribbons and ornaments are found in pieces of art of these times. 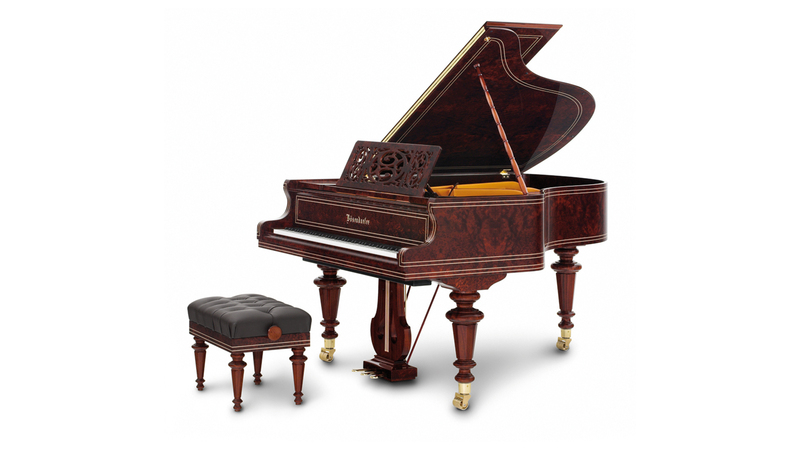 The Bösendorfer Grand Louis XVI is dedicated to this style of simple yet playful style of Classicism. Beethoven, Mozart and Haydn were in love with her, Schubert and Schönberg admired her. The city of Vienna, like no other, has been the focal point of music in art since centuries. Names like the Vienna Philharmonic Orchestra, the Vienna Boys’ Choir and the Viennese Waltz are world famous and are ambassadors of the city of music. Our Bösendorfer Grand Vienna pays tribute to our city which Bösendorfer calls home for nearly two centuries. The Polish piano virtuoso and composer Frédéric Chopin has devoted himself in all his works foremost to piano music. Whether you listen to his mystically thoughtful Nocturnes or his melancholic Waltzes, Chopin allows us a deep glimpse into his soul: affectionate and expressive. On the occasion of his 150th anniversary we have created an exclusive instrument to pay tribute to the master of piano compositions. 1828, Vienna: When Ignaz Bösendorfer started his own piano manufacturing company the young virtuoso Franz Liszt is ruining almost every piano by his passionate play. At this time, there are nearly 150 piano builders in Vienna alone, which actually illustrates the importance of piano music. Following the advice of his friends Liszt selects a Bösendorfer Grand for his concert and, in fact, this piano withstands his powerful performance. Bösendorfer becomes famous overnight. A close friendship shall evolve between Franz Liszt and Bösendorfer. It is known to be an old tradition: Each and every year the legendary Vienna Opera Ball takes place at Vienna's State Opera and after the welcoming speech ends with “Alles Waltzer” the orchestra opens the festivity with a masterpiece by none other than Johann Strauss. Strauss Junior (1825 – 1899) was also called the King of Waltz, since no other piece of music shall be remembered as well as his Waltzes with Vienna.